You’ve likely seen the recent media stories about orthorexia, a term used to describe a pattern of disordered eating involving pursuit of dietary purity and perfection in the name of health. While orthorexia is not yet an official diagnosis like anorexia, bulimia or binge eating disorder, its effects can be just as damaging. The surge in media attention is likely due to the surprise many feel when they hear that healthy eating can be dangerous. Aren’t we bombarded with messages about health every day? What about the push to eat more fruits and vegetables, to eliminate soda, to display calorie amounts on restaurant menus? In the face of the public obsession with health, and the claims that none of us are doing it right, it can feel confusing to hear that healthy eating can be problematic. Eating a wide range of foods we enjoy is important for both physical and mental health; what and how we eat is of course important to our overall well-being. However, nutrition as it has been portrayed by the media can be problematic, as these sources often communicate a very narrow—and usually misguided—definition of which foods are okay to eat and which aren’t, and the lists vary greatly depending on the source. Think about the dozens of different ideas about what healthy eating looks like. For each of them, it is easy to find adherents who are adamant that their way of eating is the healthiest. But how can this possibly be true when they so often contradict each other? Following these food guidelines may not be inherently problematic (except that they all risk distancing followers from their innate hunger and satiety cues, not to mention natural taste preferences). A problem arises when an individual integrates these guidelines in an increasingly rigid manner and begins to attach morality and their sense of self-esteem to their ability to follow the rules. What may have begun as a choice to explore different foods becomes an obsession with dietary perfection. Once orthorexia is established (an insidious process the individual may not be fully aware of), eating behaviors are compulsive and the individual is no longer psychologically able to practice flexibility in eating habits. This compulsive need to continue the dietary guidelines is a very clear marker that an eating disorder is present. 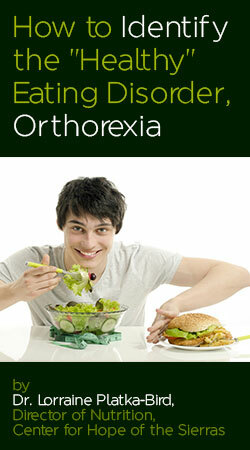 A few different factors make orthorexia particularly difficult to identify. The first is that many behaviors involved in this type of eating disorder are held up culturally as the gold standard of responsible eating. People who are very controlled with their diets and vocal about their pursuit of health are often complimented for their self-control, and others may idolize what they see as a virtuous approach to eating. Further, many people who struggle with orthorexia continue to eat regular portions at regular intervals and many do not see a change in weight because nutritional “perfection” resulting in “perfect” health, disease prevention and physical purity are the goals, not necessarily weight loss. Often, orthorexia becomes so restrictive that the individual starts to exhibit symptoms similar to those in anorexia, but these symptoms needn’t be present before deciding there is a problem. Have the food rules and list of permitted foods become increasingly restrictive over time? Does the individual experience guilt, shame or anxiety when “forbidden” foods are consumed? Do the individual’s food behaviors and beliefs prevent him/her from eating at social events? Has the person decreased their participation in interests and hobbies not related to food, health and nutrition? Is the individual able to eat freely at social events and share food with others, or do they tend to bring and eat only their own food? Does the person demonstrate traits of perfectionism in other arenas of his/her life? Does the person allow for different ideas about how to achieve health, or is he/she fixated on his/her approach being the only way to achieve ideal health? Does the person’s ideas about food and health interrupt normal functioning at work/school, in relationships, etc? Are they able to choose foods based on pleasure or convenience, even when those options don’t fit their definition of healthy? Is the individual’s approach to exercise and fitness compulsive/obsessive? 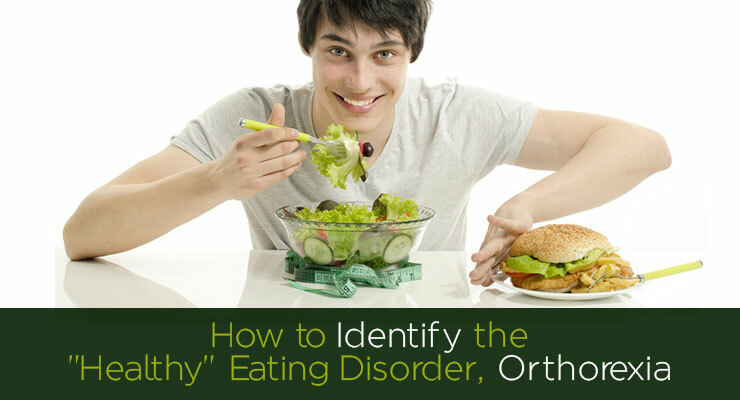 Because orthorexia is not an official diagnosis, we do not yet have an established set of criteria to clearly identify whether somebody might be struggling with this disorder. Rather than serve to diagnose, the list above is intended to help identify those who might benefit from further exploration with a treatment professional who is experienced in treating eating disorders. Dr. Lorraine Platka-Bird received her doctorate from Michigan State University in 1980 with a major in human nutrition and a minor in psychology. 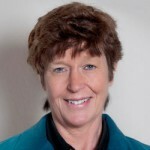 She became a registered dietitian in 1982. As a dedicated professor in the Nutrition and Dietetics Department at the State University of New York for 19 years, Dr. Platka-Bird taught a wide variety of courses including Weight Management, Medical Nutrition Therapy, Nutritional Biochemistry, Sports Nutrition, Human Physiology, Nutrition Across the Life Span, and numerous related courses. During this period of time Dr. Platka-Bird was granted some of the most prestigious teaching awards offered in the State University system. Dr. Platka-Bird has been counseling individuals with eating disorders for over 25 years. She takes a holistic approach to treatment, considering all aspects of physical, mental, social, emotional, and spiritual well-being. In addition to helping clients develop a healthy relationship with food, Dr. Platka-Bird helps individuals minimize eating disorder thoughts and behaviors, improve self-image and self-esteem, and develop healthy coping skills and life skills to improve overall quality of life. Thank you for sharing about this important issue!